air gun target system kits are modular, meaning the face plates and target stations are interchangeable. threaded inserts for the face plates and target stations, prevent stripping of the wooden bases. hardware including bolts, nuts, washers, springs, and hinges are included. templates for fitting target stations, reset bar with collet, spring holder, and shelf mounts are included. target plates in thickness 0.140 inches (3.6 mm) are standard. 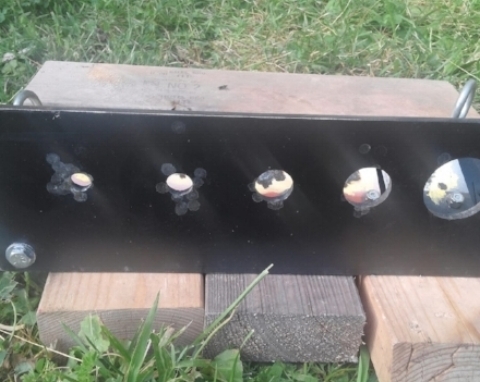 air soft targets use wood and lighter gauge steel for base, target faces, target plates. Threaded inserts are not standard but are available via custom ordering. the re-settable magnetic system is optional on the RX bull challenges. products are competitively priced and shipped assembled, with exception of the face plate which is attached with hex bolts. shipping weight for one kit averages 8 pounds. buy one base and set of paddles, easily interchange face plates with removal of two hex bolts. add $5 for painted face plate other than black or white. $ 25 Field target bases : stained and poly coated, drilled for shelf or ground mounting, Rxtargetsystems logo. $ 65 Sport team or company color target system: choice of bull challenge, two shooter bull challenge (can use one team for each shooter), field target trainer. includes coloring of base, target plates, and face plate. Vincent Louis Alessi's AAFTA target in use. Jeff Swartz's American Airgun Field Target Association trainer. I look forward to working with you or your club to provide a great product to improve and maintain shooting skills. Please leave a detailed note and contact information below. Be specific with style, color, quantity, vendor, or retail purchase.